Description: 41T rolls west over the Chenango River with a pair of newer units and an old veteran. Description: 41T has changed crews and is now on its way to Buffalo, crossing the Chenango River on the ex Erie bridge. Description: Its busy at East Binghamton this morning. At left, on the 2 runner, is 167, led by Dual Flag painted 5813. Next to it, on the 1 runner, is 41T, with CN 2640 leading. He'll roll on through, leaving 167 to finish doubling his train. At far right is the CP Holiday train, its GE flying American and Canadian flags as it readies for a performance in the evening. Description: C44-9W # 2660 heads west thru Jasper in late afternoon. Description: CN 149 heads west with 2 CN GE's. Description: Two CN GEs power todays WC transfer. Description: Route 34, Victory Road @ MP 262.24, 1336 hours. Description: CN 500 rolls out of the yard as 490 makes a set out. Description: CN engines # 2660 & # 5721 roll out of the rockcut at Eagle Mills Jct running light on a sunny afternoon. I would like to thank my dad for takeing me railfanning. Description: CN engines # 2660 & # 5721 roll out of the rockcut at Eagle Mills Jct running light on a sunny afternoon. I would like to thank my dad for takeing me railfanning. Photo taken with my brandnew Nikon coolpix L22 digital camera. Description: CN engine # 2660 leads CN 5721 out of the rockcut running light at Eagle Mills Jct. Thanks to my dad for taking me railfaning. Photo taken with my brand new Nikon Cool pix L22 digital camera. Description: The trailing unit CN engine # 5721 passes on by running light at Eagle Mills Jct. Special thanks to my dad for taking me railfanning. Photo taken with my brand new Nikon Cool pix L22 digital camera. Description: A nice crisp shot of CN engine # 2660 as she rolls by running light at Eagle Mills Jct near Riihinen Rd. Anyone know what that bright orange box above the ditch light is? Photo taken with my Brand new Nikon L22 digital cam. Description: CN engines # 2660 & # 5721 pass MP Q68 running light at Eagle Mills Jct. Photo taken with my Brand new Nikon L22 digital camera. 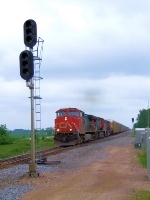 Description: CN engines # 2660 & # 5721 split the signals at Eagle Mills Jct. Photo taken with my Brand new Nikon L22 digital camera.